Here is a rechargeable LED lamp that gives you bright light for a long duration of time as it consumes little power. The circuit presented here is compact, automatic, reliable, low-cost and easy to assemble. The circuit comprises power supply, battery charging and switching sections. The power supply section takes power from 230V AC mains supply without using a transformer. Capacitor C1 is used as an AC voltage dropper a well-known transformer-less solution. This helps to make the circuit compact without generating heat, as capacitor C1 dissipates negligible power. Capacitor C1 also protects against fluctuations in mains. Current required for the battery charging circuit is provided by capacitor C1. Capacitor C1 discharges through resistor R1 when the circuit is disconnected from the mains voltage. This helps to prevent a fatal shock due to any voltage remaining in the input terminals. Capacitor C1 must be rated at least 440V AC, with mains application class X2. The AC mains voltage after capacitor C1 is given to bridge rectifier diodes D1 through D4 to convert alternating current into direct current and filtered by capacitor C2. The voltage from point B+ is given to positive terminal of the battery (BATT), anodes of LEDs (LED2 through LED21) and transistor base-bias resistor R3 through slide switch S1. The circuit is operated in three modes (AC/charge, off and batt) by using three-position switch S1. When switch S1 is in middle position, the circuit is off. When S1 is towards right, white LEDs glow by drawing power from 4V battery. When S1 is towards left, the circuit connects to AC mains and battery starts charging. 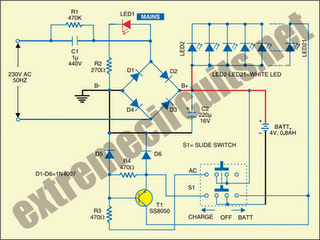 The presence of AC mains voltage and battery charging is indicated by LED1. White LEDs remain off if AC mains supply is available and glow in the absence of AC mains. When switch S1 is towards left position and AC mains is available, the battery charges through diode D6 and the white LEDs don’t glow. The negative DC path through diode D5 makes the transistor cut-off, preventing the battery current from LEDs to the negative terminal through the transistor. Thus the white LEDs don’t glow. On the other hand, if AC mains is not available, charging stops and the base of transistor SS8050 gets positive voltage from the battery through slide switch S1 and resistor R3. The transistor conducts and the current flows from the battery’s positive terminal to the negative terminal of the battery through the LEDs (LED2 through LED21), collector to emitter of transistor T1 and switch S1. Thus the white LEDs glow. When the switch is in ‘batt’ position, the white LEDs (LED2 through LED21) get the supply directly from 4V battery through switch S1 and therefore all the white LEDs glow. Assemble the circuit on a general-purpose PCB and enclose in a suitable cabinet. Fix the mains power cord on the back of the cabinet and slide switch and LEDs on the front side.